Junior quarterback Jake DeMilia (5) a gets off a throw as he is pressured by New Canaan defenders. 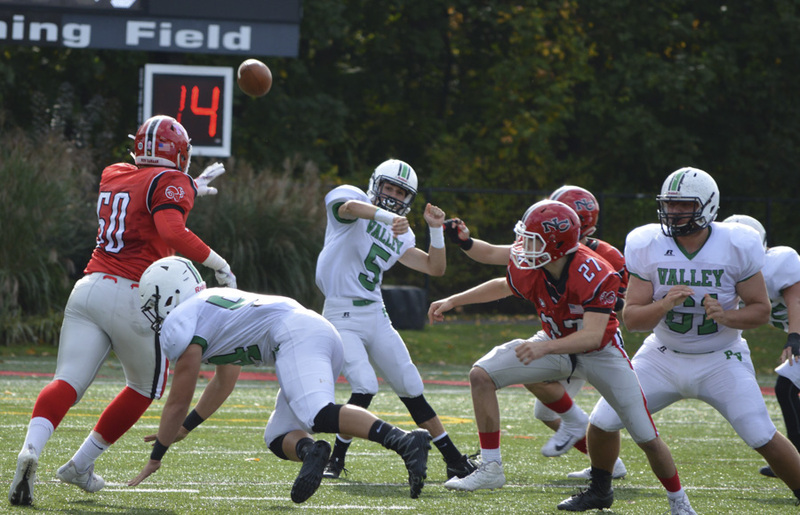 Although Pascack Valley did not beat New Canaan on Saturday afternoon in Connecticut, instead falling 33-14 to one of the perennial top programs in Connecticut, the Indians walk away richer for having made the trip. It was indeed the underclassman that led the way for the Indians on both sides of the ball. Defensively, the Indians were able to hold a potent Rams offense that came into the contest averaging just under 42 points per game to 33 points and three touchdowns. “Our defense definitely did enough [on Saturday] to keep us in the game,” Cusumano said. Highly-recruited signal-caller Drew Pyne threw for 248 yards, including all three of the Rams touchdowns, but was intercepted twice by two Indian sophomores, Joe Cuti and Jake Ciocca. While Pyne was under constant pressure from the Valley front, and the secondary was able to stay with most of the New Canaan receivers, the high-powered offense exploited any mistakes made by the Indians. Junior Quintin O’Connell hauled in nine catches for 152 yards, while senior Owen Shin rushed for 88 yards. Conversely, Pascack Valley was not able to capitalize on the uncharacteristic errors made by New Canaan, something that is necessary when playing against such a high-caliber opponent. The Indians could not take advantage of the Rams’ two turnovers nor the 15 penalties assessed against them. Unfortunately for Valley, its offense mustered just 223 yards and turned the ball over twice themselves. With little room to run, the Valley ground game struggled to get much going, rushing for 167 yards, 60 of which came on a Mike Gulino touchdown run. Gulino, a sophomore led the way for the Indians, rushing for 89 yards, and accounting for both Valley touchdowns on 19 carries. In the absence of starting quarterback Stephen Begen and backup Sam Cassidy, Pascack Valley relied on a pair of underclassmen under center. Junior Jake DeMilia took the majority of the snaps for the Indians, completing 5 of his 11 pass attempts for 40 yards. Sophomore Jake Williams completed just two passes for 16 yards and was intercepted twice. Williams also rushed for 55 yards. Next week, with their new experiences in tow, the Indians (2-6) will be on the road again on Saturday. However, they will remain in the Garden State and take on Bergenfield (5-3) at 1 p.m. Last year, Bergenfield defeated Pascack Valley 23-17.